Each year, the Tire Review Tire Brand Study provides a pulse check on the marketplace, exploring how tire dealers feel about how well the brands they regularly stock perform in the market. Through our partners, we collected and analyzed dealer responses from more than 1,500 completed telephone surveys of retail and commercial tire dealers, and measures were taken to assure a fair sampling of dealers geographically and to limit the impact of large regional or national dealerships. To level the playing field even further, this year we made sure that each brand had the same number of responses taken into account to protect against oversampling and to ensure the consistency of results. Criteria include: value, product quality, a favorable adjustment policy, strong brand awareness, fuel efficiency, high fill rates and the ability to make a decent profit. To be listed in these published results, a consumer tire brand had to have at least 40 specific mentions, and truck tire brands required at least 20 specific mentions. Dealers were asked to rate each brand of tires they carried on a 1 to 10 scale – 10 being highest – on a series of criteria. An aggregate overall score for each brand was calculated, averaging the results from each category. It’s worth noting that Tire Review’s Tire Brand Study measures dealer opinions and perceptions about the brands they regularly offer. In gathering data, dealers could not comment on brands they did not carry, and consumers and end-users were not polled. No tires were physically tested. Custom brand research is also available by contacting Tire Review Publisher Randy Loeser at [email protected]. 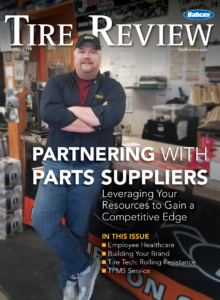 All Tire Review research is free to current subscribers of the magazine or digital edition. All you need is your 6-digit subscriber number found on the mailing label of Tire Review. Non-subscribers may purchase Tire Review research for a small fee. Babcox Media does not collect or store any personal financial or credit card information while processing transactions.